The TD seed drill from Davimac Engineering consists of 4 tool bars spaced at 550mm so the seed drill can handle trash and residue. With a heavy duty frame of 100x100x9 RHS and a 12 and 16mm plate, the TD has the strength and also the weight to deal with challenging conditions. The loading platform is 745mm wide which makes it easy to access the large capacity seed and fertiliser boxes which are powder coated for a longer lasting superior finish and prevent rust. The seed box can hold 205 litres of seed as well as 205 litres of fertiliser per metre of box. There are also large windows so you can keep an eye on the levels. 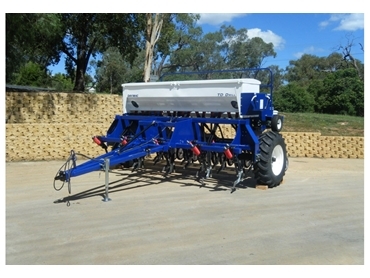 The undercarriage of the TD seed drill has standard coil tynes or spring release tynes can be fitted for more trash flow and a higher breakout.